Many albums are called timeless but few are... Love is one that truly fits the word. The unmistakable opening of She Sells Sanctuary was used recently in a cutting-edge Nissan commercial, sounding as new as next year's model. 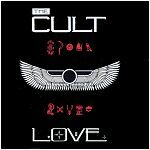 Fifteen years later it's still a welcome staple of the Cult's live sets, along with Rain and Revolution, and they sound as fresh now as they did in 1985. Astbury's vocals are much stronger on this second album, and ongoing themes in his lyrics of social isolation, joy, and Native American-flavored spiritualism begin to fully develop here. Duffy's guitar work continues to build his reputation as a guitar hero, demonstrated in The Phoenix -- reminiscent of Hendrix in style and virtuosity, but far from derivative. "this cd has served a special purpose in my life a while back when i lost my grandmother to certain illness, when she passed on i used to listen to black angel every night before i went to sleep and sure enough it got me through the rest of the year..."
-- A music fan's review at Amazon.com... this album is like that.